Rajasthan Royals visited Mumbai Indians in the 47th match of IPL 2018 at the Wankhede Stadium. Both the teams are in the hunt for a playoff spot and every match is like a knockout for them. In a crunch game, RR held their nerves and defeated the defending Champions in their own den to make their claim stronger. Ajinkya Rahane won the toss and asked the hosts to bat first as some dew was expected in the latter half of the game. MI had a wonderful start to their innings as the first over yielded 14 overs. Suryakumar Yadav and Evin Lewis were in an explosive mood and dominated the RR bowlers from the outset. After the end of the powerplay, the score raced off to 51/0. Both the batsmen matched each other shot for shot and the score was flourishing. Lewis struck 2 consecutive sixes to Shreyas Gopal in the 9th over and he was looking in an ominous touch and on the other hand, Suryakumar extended his brilliant run of form as the hosts reached 86 without loss at the halfway stage. Suryakumar was on his way to yet another half-century but Jofra Archer had other ideas. In the 11th over, he delivered a quick bouncer to the batsman which induced a top edge. The ball flew towards deep fine-leg where Jaydev Unadkat was stationed. He ran in to take a wonderful catch to send the batsman packing for 38. 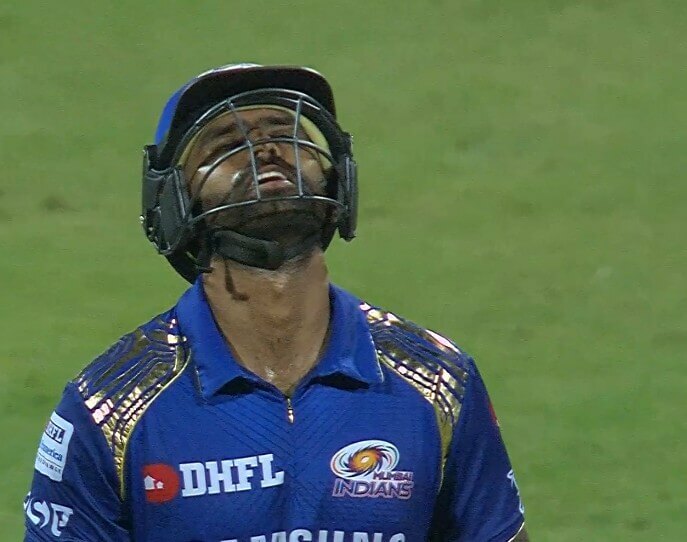 Off the very next ball, RR delivered a body blow to MI as another bumper from Archer inflicted one more hook shot towards the same fielder who accepted the catch with both hands to send the MI skipper Rohit Sharma back in the hut without opening his account. All of a sudden, the hosts were in a spot of bother at 87/2. Lewis brought up his fifty but the pressure to take the side to a big score got to him as he fell prey to Dhawal Kulkarni for 60 in the 14th over. The RR bowlers applied the brakes that resulted in the wickets of Ishan Kishan and Krunal Pandya very cheaply. After 18 overs, MI reached 136/5 and were in danger of falling short of a competitive total. But Hardik Pandya’s 36 off 21 propelled them to 168/6 after 20 overs. RR were dealt with a massive blow in the first over when Jasprit Bumrah sent back D’Arcy Short in the very first over. But as it turned out, his wicket proved to be the sole bright spot for the hosts for quite some time. The man in form Jos Buttler took it upon himself to take care of the required run-rate. The captain Rahane provided good support to Buttler who punished the bowlers when the fielding restrictions were on. The score after the powerplay read 51/1 and the chase was well and truly on at the Wankhede. The explosions kept going even after the restrictions were lifted and the MI bowlers were left clueless. Buttler got to his fifth fifty in a row and equaled the record of Virender Sehwag. The partnership for the 2nd wicket yielded 95 runs before Rahane got out for 37 in the 14th over. MI would have hoped to capitalize on the opportunity but the new man Sanju Samson ensured they were kept at bay. There was no stopping Buttler who kept mocking the bowlers. By sending the ball regularly to the fence, he ran away with the game from the hosts. Samson departed in the 18th over after scoring 26 but Buttler completed the formality and won the game for his side with 2 overs in hand. The Englishman remained unbeaten at 94 from 53 balls that included 9 fours and 5 sixes. IPL 2018, Match 46, CSK v SRH: What was the Moment of the Game?